A pseudo-bottle episode stands in for the normally plot and cast-packed second to last episode of the year. 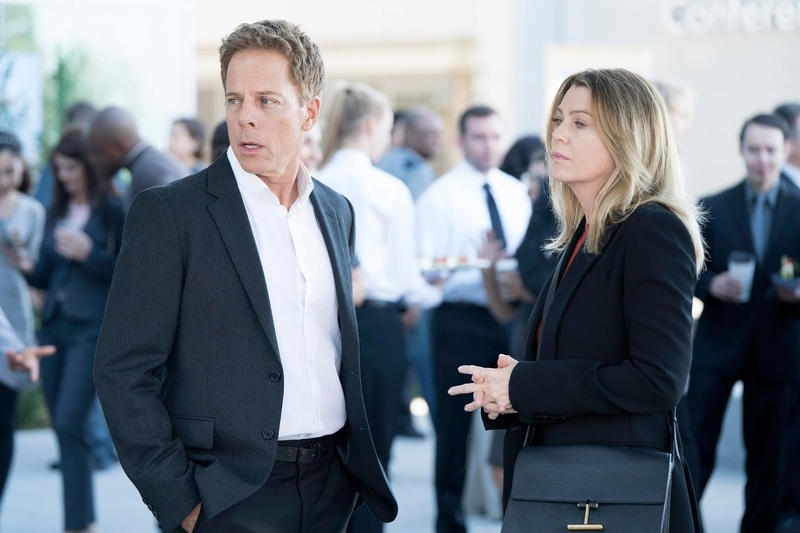 While the latest entry in Grey's Anatomy may not directly play out in what appears to be an action-packed winter finale, the three storylines will most certainly have an effect on the rest of the season. If you watched this episode and aren’t sure what the point was, it focuses on Richard, Catherine, and the extended families of those closest to them. So let's dive in! Catherine hasn’t popped up since the season fifteen opener because she's been very busy with putting the final touches on converting the Harper Avery Foundation hospitals to Catherine Fox Foundation hospitals. Much to Richard’s chagrin, Catherine decides to stay in Los Angeles an extra day for the ribbon-cutting ceremony of her latest masterpiece and to welcome Meredith Grey and Tom Koracick for a consult. The two docs, under the impression that their VIP patient will be an A-list celebrity, have their worlds rocked when they learn that Catherine is their patient and a recent scan revealed that she has a massive spinal tumor. The three characters of this story spend the episode reeling from the news that Catherine could potentially be very sick. Tom performs a biopsy to find out exactly what type of tumor they are dealing with. If you are wondering why Catherine asked Tom and Meredith to be her doctors, there are some very good reasons: Obviously, Meredith is very close to Richard, who is going to need a lot of support once he finds out the grim news. Meredith is also considered to be one of the best general surgeons in the country (and let’s not forget those early years where she was training to become a neurosurgeon under Derek). Catherine trusts Meredith and goes way back with Tom. The nice part of this emotional story is that we get more backstory on Tom. He tells Meredith that Catherine is a very close friend of his and that she was the one to wake him up from his hazed slump after he lost his child. He credits Catherine with helping him to realize his full potential as a surgeon. And as one of the best neurosurgeons, Tom is Catherine’s first choice. Unfortunately, Catherine has a chondrosarcoma on her spine, which is a form of cancer that cannot be treated with chemotherapy. Tom is nervous about attempting to excise the tumor because she could become paralyzed, a quadriplegic, or die during the surgery. Catherine has fought many battles in her life, so I don’t expect for her to give up easily. I’m more worried about how her husband and son will handle the news, considering both are in downward spirals lately. The second plot of the episode follows Richard through a day at Grey Sloan Memorial. One of his favorite, and prodigal, nurses happens to collapse in pain in front of him. Oh, and she’s 28 weeks pregnant. Richard personally cares for Nurse Frankie all day, who then decides to go against Richard’s wishes and not have surgery to fix her splenic torsion. She decides wait and see if her spleen will fix itself so that she doesn't have to put her baby in harm’s way. This proves to be a fatal mistake: Frankie’s condition gets worse, leading to surgery. In the OR, Richard does everything he can to save the nurse’s life, but he can’t find the source of the extreme bleeding. He calls Alex to meet him in the OR in case the baby has to be delivered, that way the child can get the best care possible. Alex arrives in time to deliver the baby and save its life. Richard’s attempts at saving Frankie’s life fall short, and he is so emotional that he can’t say the time of death. Richard then delivers the bad news to the rest of the nursing staff. He’s had a pretty tough go lately — the loss of Olive, not going to AA meetings, not finding a new sponsor, keeping things to himself, not having his wife around, and now having one of his favorite nurses die on his watch. To say that this character needs help is an understatement. In a brief glimmering moment of hope, Richard goes to a short-lived AA meeting. He storms out of the building after hearing a woman tell a story about a local bar that gives free shots for AA chips in the form of one shot per year sober. In the next scene, Richard finds and goes into the aforementioned bar, gives the bartender his chip, and has eight shots of vodka poured in front of him. This was the first moment of the episode where I truly thought that Richard had lost it. After staring at the shots for a moment, he gets up, goes behind the bar, grabs a baseball bat, and starts smashing everything in sight. He tells the frightened bartender that taking away people’s sobriety ruins lives and that he doesn’t appreciate it. Granted, this has more to do with his own inner struggles than the bar’s practices but the point stands. The episode ends with Meredith getting a collect call in L.A. from Richard, who has been arrested for his actions. This second moment of Richard losing it is more startling than the first. His actions are more than a cry for help. I’m assuming he is going to be charged with destruction of property and could be facing jail time, which could in turn affect his medical license. Between his outburst and when he eventually learns that Catherine is sick, Richard needs to find help before it’s too late. If there’s one character that I’m concerned won’t make it out of this season alive, it’s Richard. The final story of the episode features Jackson and Maggie trying to reconnect. Things seem to be back to normal until Maggie accidentally picks up Jackson’s phone instead of her own and finds several text messages from another woman saying that she misses Jackson with several heart emojis. Naturally, Maggie is furious and accuses Jackson of cheating on her with the mystery woman. Jackson denies the allegations immediately and tells Maggie that he met this woman while on his spiritual sabbatical and only talked with her. He tries to get Maggie to understand that he opened up to this woman about his stress and problems because she had been through similar experiences. Jackson, who is already on thin ice, says that it was nice to talk to someone who understood where he was coming from. Maggie briefly decides that Jackson is telling the truth and that situation with his new confidant isn’t earth-shattering. She tries to be a better girlfriend by giving Jackson the chance to open up to her and tell her all of his problems, but it goes south quickly. Jackson all but says that he still has feelings for April and is grieving the end of their relationship. Guess it finally hit him after... how long? Jackson is shocked when Maggie gets up and leaves in tears, saying that she can’t do this. Dude, how can you be surprised that your girlfriend probably wants to dump you after you tell her you are talking to other women and might have feelings for your ex-wife? Considering his fragile state this season, the news of Catherine’s illness will probably hit Jackson hard, and it might be the thing that brings him and Maggie back together since it impacts Richard, and therefore her, too.